Some clients develop a preference for one of our veterinarians and our customer care team always strives to schedule appointments with a preferred veterinarian. If for some reason that is not possible (our veterinarians do take a day off occasionally and a vacation from time to time), please know that all of our veterinarians work well together and keep each other informed about cases. Sometimes 5 heads are better than one. Our veterinarians work well as a team and often consult with one another on cases. All of our veterinarians are general practitioners, but each one has different strengths that can be called upon when a pet is in need. Angela Burrington is the Medical Director for the Veremedy Pet Hospital. Angela grew up in New York City, but always planned to work with animals and live in the country. 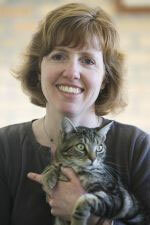 Her dreams came true after graduating from Cornell Veterinary School in 1989 and moving to the Upper Valley area. Before coming to Veremedy and specializing in the care of small animals, Angela worked for 8 years as a mixed-animal practitioner working with both large and small animals. Angela lives with her husband Brad and their two daughters. Angela and Brad also share their home with their adopted dog Holly, three cats, a rabbit and two guinea pigs. They maintain a pet flock of sheep and several laying hens. In her spare time, Angela enjoys gardening, yoga, hiking, snowshoeing, and exploring national parks. 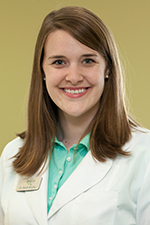 Her professional interests include feline medicine and surgery, ophthalmology, and cancer treatment and care. Angela enjoys treating small mammal patients such as rabbits, ferrets, guinea pigs and rodents. Sarah is a graduate of the Tufts University Cummings School of Veterinary Medicine and Georgetown University. While at Tufts, Sarah developed a special interest in caring for small animals with cancer and received an award from the Veterinary Cancer Society. Sarah is also a member of the Phi Zeta veterinary honors society. Sarah loves spending time exploring the mountains of Vermont and the waters of Lake Champlain. She enjoys visiting antique shops, local restaurants, and spending time with friends and family. Sarah is thrilled to have ‘come home’ to Vermont. Originally from central New Jersey, Gina Roberts attended the University of Vermont where she earned a BS in Biology and Animal Science. It was there as a UVM undergrad that she developed her great love for the Green Mountain State. Gina went on to receive her DVM from Oklahoma State University. She began her veterinary career in upstate New York where she worked in a rural, mixed animal practice for 3 years. During that time, she worked with both small and large animals. More recently, she began to focus on small animal medicine, nutrition, and surgery, and developed an interest in pocket pet medicine. 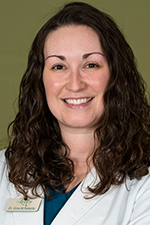 Gina has now combined her passion for small animal medicine and her love for Vermont by joining the Veremedy team. She enjoys outdoor activities with her dogs, camping, hiking, and skiing, as well as cooking and traveling. Gina resides in the Upper Valley with her two dogs, Jager and Bailey. Nell grew up in Chapel Hill, NC and is a graduate of the University of North Carolina. After spending a year in Santiago, Chile teaching English, she returned to the United States to attend veterinary school at Cornell University. 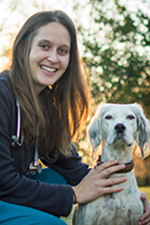 During vet school, she became passionate about small animal medicine and working with owners to come up with the best medical care options for their pets. Outside of work you’ll find her hiking with her dog – an English Setter rescue named Winifred, riding horses, listening to folk or bluegrass music, or generally exploring the outdoors. She loves living out in the country and couldn’t be more excited to have moved to the Upper Valley to join the team at Veremedy. Brad Burrington is the founder of Veremedy, LLC, the company that started the Veremedy Pet Hospital, and the head coach of our medical information and services team. After earning his DVM degree from Cornell’s College of Veterinary Medicine in 1987, Brad became a well-respected large and small animal veterinarian in Upstate New York and New Hampshire, and later in Vermont. Dr. Burrington is a member of the Veterinary Evidence-Based Veterinary Medical Association, and he enjoys working in a team setting. Dr. Burrington is also the co-founder of the New England Foundation for Animals, a nonprofit organization dedicated to helping animals in need. Brad lives with his wife and fellow veterinarian, Angela, as well as their two daughters and their many pets. 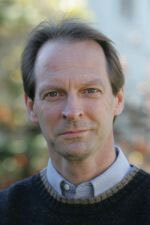 Outside of Veremedy Brad enjoys landscaping, reading, political history, and an occasional round of golf.